Headlines – the effect of Brexit? Average prices across the indices vary from mortgaged-only prices from the Nationwide HPI of £211,996, through to marketing prices (ie not necessarily sold) from Rightmove of £298,734 and actual prices from LSL Acadata HPI of £306,647. Average sold prices from the UK HPI stand at £230,630. There is a 44% difference between the highest average price from LSL which includes cash sales and the lowest from Nationwide which reflect mortgaged homes. Bumble along slowly in fits and starts if we don’t get some certainty soon, but economically still remain in positive territory. Bounce back quickly for part of the year if we Brexit smoothly. London and the South and East are holding back growth in England year on year, but since the recession it’s very clear this growth has driven the housing market well. Although Wales is doing very well year on year according to UK HPI data, other reports suggest growth is now slowing. It’s a similar picture in Scotland too. It is quite astonishing the property market in these areas – and indeed Northern Ireland continues to do well currently when in comparison to the last 10 years, real versus nominal growth has been non existent. This shows that whatever the market is doing, people do still need to move. Estate agencies’ stock levels remain close to record lows, currently standing at an average of just 42 properties. Pre-2005, property prices tended to move ‘in the same direction’. London would grow, then the regions would follow, London falls and so would the regions. The chart below shows that this isn’t the case anymore. This chart compares the year on year changes; average annual changes since the 2007 recession and then back to 2005. This data shows that property price growth is now anything but smooth and certainly hasn’t achieved the previous ‘long term growth’ tracked by Nationwide of property prices outstripping inflation by over 2.5%. In fact, what this information shows, is in many areas, based on annual inflation being around 3% per year since 2005, only the East and London have seen house prices perform above this level and that’s for the last 15 years. 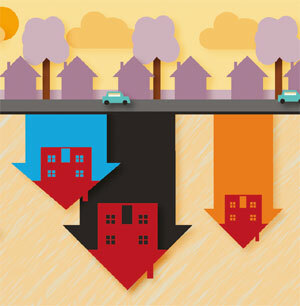 In many areas, property prices in real terms have fallen. However as LSL point out at the moment, this doesn’t seem to be affecting consumers: “The fact that house prices in many parts of England & Wales are falling in real terms remains of limited interest to most participants, at least while nominal (actual) gains are still being recorded.” The question is, what will happen when people realise prices aren’t rising at the same level as they were in the past? Kate says: From a regional perspective, there are clearly vast differences, but these pale into insignificance when you look at the cities’ data. There is such a stark difference in performance, with the likes of Belfast property prices still 40% lower than they were in 2007, while Newcastle is struggling to gain much ground since 2005. Most cities have kept up with inflation since this time, but only if bought in 2005, anyone buying since that time is likely to have seen negative real property price growth, with only the regular ‘hotspots’ of Oxford, Cambridge, London, Brighton, Reading and Bristol seeing property prices in line with or slightly above inflation increases. Considering more people are owning a home outright, it will come as a surprise to that their property in real terms, is actually worth less than it was 10-15 years ago. Kate says: It’s clear that few places are seeing any decent transaction growth. LSL estimates a 2.5% fall in 2018 and this year could go one of three ways depending what happens with Brexit and at a global level. So far, transactions have held up probably better than ever before considering the low price growth figures and uncertainty in the housing market. Feedback from agents suggests the demand and supply is still there, but not perhaps the confidence to make offers at the level seen before. LSL Acadata HPI: “In December 2018, there were an estimated 78,250 transactions – based on Land Registry counts for England & Wales – which is a 6.6% fall on our revised November figure of 83,750 sales. One would normally anticipate an upward movement in sales volumes of +1.5% at this time of the year, so the decrease of -6.6% represents a negative -8.1% fall in transactions on a seasonally-adjusted basis. UK Finance: “There were 36,200 new first-time buyer mortgages completed in the month, some 5.8 per cent more than in the same month a year earlier. The £6.0bn of new lending in the month was 9.1 per cent more year-on-year. The average first-time buyer is 30 and has a gross household income of £42,000. The Advisory tracks current housing market conditions. So buyers and sellers can gain an independent view of how easy it would be to buy and sell their home in their area. This makes it easier for good agents that are honest about market conditions to value and manage expectations. For example, in BS3 75% of the properties on the market are under offer.